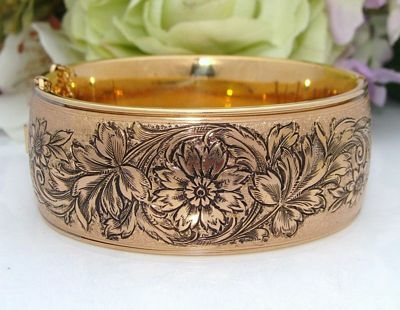 This Vintage “Antique” 12 Carat Yellow Gold Filled Cuff Bangle Bracelet is Outstanding! It is a quality piece from a renowned maker established around 120 years ago. Its Antique inspired design is reminiscent of the mid-Victorian era but is newer dating to around the 1920 and 30s, a Victorian Revival period for jewellery. Scrolling across each side is an array chrysanthemum and Forget-Me-Not-like flowers in various sizes with foliage, all intricately detailed and set upon a richly patterned background. It is superbly accented with black enamel-like detailing and with domed sides, it is very substantial. The hinge and clasp are in perfect working order with a safety chain for additional security. It closes securely with a snap. This bangle bracelet has a wonderful warm yellow gold hue and that silky smooth feel usually only associated with solid carat gold. Maker: Finberg Manufacturing Company, est. 1888 & renowned for their quality pieces, including watch fobs, bangles, bracelets & lockets, which are highly sought after. Width: 2.52cm or a full inch! MINT Vintage condition! It is my opinion this beauty has never been worn. There is no wear anywhere, dents, damage or repairs to mention. It looks Awesome on the wrist and chances of seeing another just like it are very slim!